Theory of Gardening 101: Plant everything of interest and observe what survives. 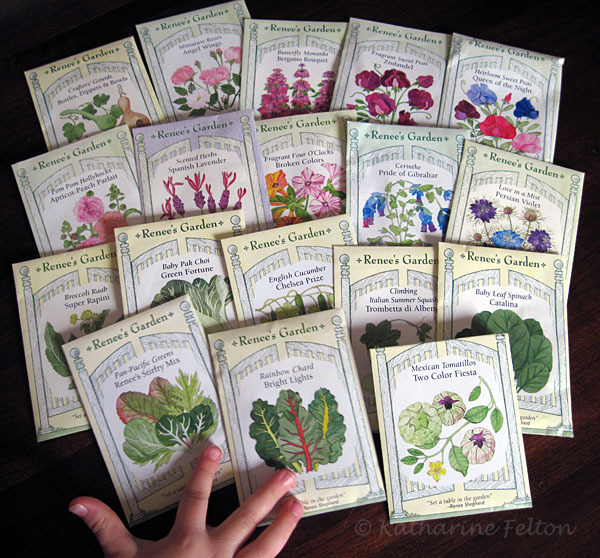 This summer, I’ll be participating in the seed GROW project, sponsored by Renee’s Garden. You can find more information and links at Grow, but the basic idea is that a group of garden bloggers will all be growing the same plant, from seed, and blogging all the details. A few weeks ago, I received my seeds for the Grow project. This time around, all of the participants are growing spitfire nasturtiums. The nasturtiums that I grew last year didn’t really do much until the fall. I got the impression they prefer the cooler weather. I’m going to try planting them a bit earlier and see if they’ll grow up the fence around the veggie garden. 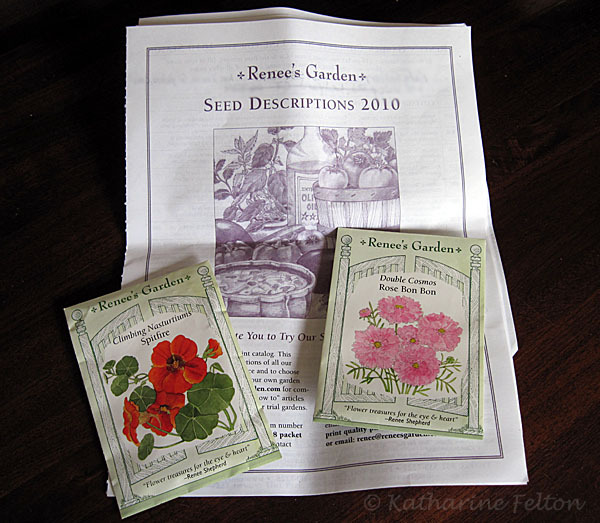 A media kit with a bonus packet of seeds was included with the Grow project seeds. I hesitated to take advantage of it, but not for long. Even though I am relatively new to garden blogging and I don’t have thousands of readers, I am also new to gardening. There are so many plants to try. I figured this was an opportunity to try some that I wouldn’t have purchased otherwise. If I find some that grow beautifully in my garden, I’ll need more seeds and know where to buy them in future years. Really, I’m starting my gardens almost from scratch and will need loads of plants to get them growing. The seed packets are fabulous. The garden fairy was excited to get her hands on them, too. Each has a beautiful illustration and is loaded with information. 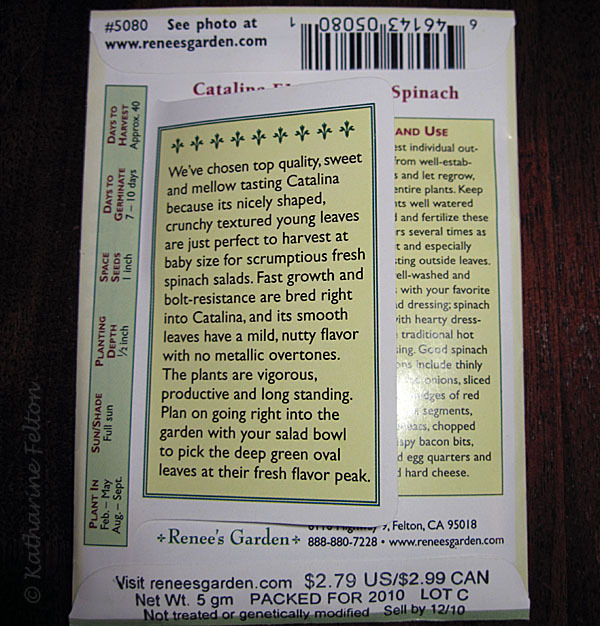 The back of the packet has an extra flap with a description of the plant. Under the flap, there are two columns, one for the planting and growing instructions and one for the harvest and use suggestions. Notice at the bottom, the seeds are not treated or genetically modified. That’s good to know. The website has photos of the actual plants, along with all sorts of extra information and growing tips. The seeds arrived pretty quick. My husband faxed the order on a Friday and it arrived the following Thursday. The only thing left is to see which varieties do well in my garden. I spent the last couple of days rearranging my plant shelves and sowing seeds. I still have more to do, but from these packets, I started the tomatillos and Spanish lavender. I have the raised beds ready for planting, but the overnight low is predicted to dip down to 25 degrees tonight. Thankfully, after Saturday night around 30 degrees, the lows are supposed to return to 40 and above. I realize there are no guarantees, but Sunday looks like a good day to plant the cool weather, early spring plants. I look forward to seeing how your nasturtiums do. I used to grow them years ago and they did well. I have been considering growing them again…. Hi Ms. Kate. Are you direct sowing your ‘Spitfire’ seeds or starting them indoors? Regardless, I’ll be checkin in from time to time to see how you’re gettin along. Kate, the evolving gardener, nurtures her plants in coastal Connecticut, zone 6. Want to be notified of new posts by email?